Notes: If your 9600 Pro or XT card looks like the one pictured above, it is one of the only models flashable for your Mac. 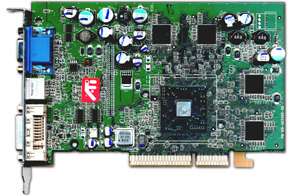 The exact board layout should not matter, but the important part is that the card uses square, "BGA" RAM chips, two each on the upper and right sides of the GPU, exactly as shown above. VGA will work (and might give poor quality picture, lavished brigthness and colours), and using a DVI->VGA adapter on the DVI port will yield a second VGA output (with clear and good quality picture), but digital DVI will not work. S-Video will not work unless Apple's DVI to S-Video adapter is attached to the DVI port. Then, the card's onboard S-Video port will be enabled. 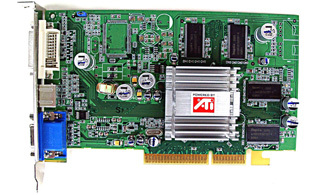 It is possible that this type of card could be flashed with the 9600 Mac/PC ROM, and it might even work in a PC if you do so. It's been tried once on a Hercules 9600XT 128Mb BGA RAM and produced puzzled display in Mac. 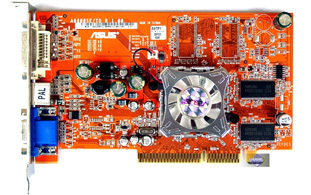 You may have more luck with a 256MB BGA RAM Radeon 9600Pro/XT. 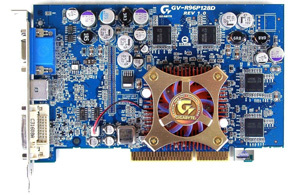 These guys take lots of high-res pictures and scans of video cards, and are a good resource to the modding community.